Off on Adventure: Trail Running with MICROspikes? Yep, I've gone off the edge. 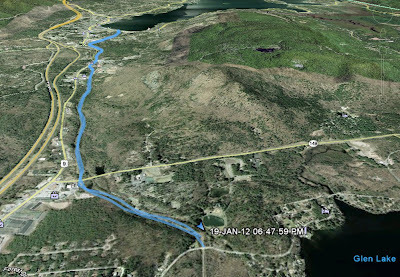 Last night I wanted to go for a run and to log some more miles for my 2012 challenge, but where was I going to run? The roads near my house have no street lights, no shoulder and cars don't give you any grace when they go by you. I thought of the bike path (the Warren County, NY Bike Path), but it was covered in a couple inches of crusty snow. Hence the MICROspikes. No motorized vehicles are allowed on the bike path, so I would be safe from traffic. There is no lighting along the path, but my headlamp could be used while running. The unknown question was... would the MICROspikes work for a trail run? 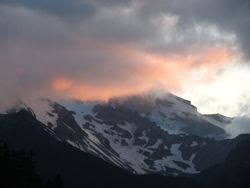 I suspected they would so I donned my headlamp, trail running shoes and MICROspikes and set off. I parked where the bike path crosses Glen Lake Road in Queensbury. I had intended to do a 2.5 mile down and back for a 5 mile round trip. 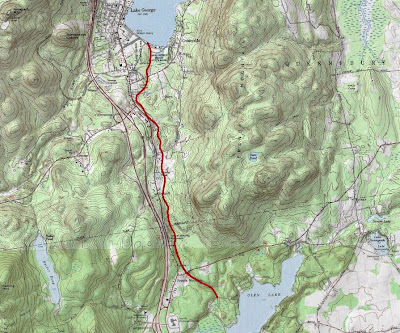 When I reached my intended turnaround (where the bike path crosses Bloody Pond Road), things felt great, so I decided to continue on the additional 1.5 miles to the southern shore of Lake George. 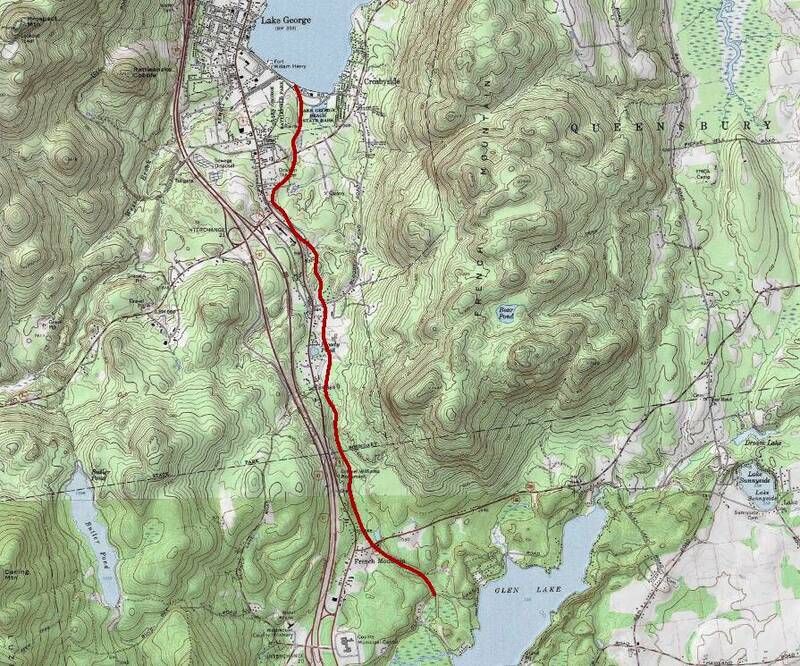 Lake George is the northern terminus of the bike path. As I reached the lake and turned around, I began to feel pressure on the outside of the ball of my left foot. The MICROspikes were working great, but the trail running shoes apparently didn't have enough sole and side support to prevent the chains of the MICROspikes from applying added pressure to my foot. Also just after I started back, a snow squall kicked in and the wind was whipping the snow around. By the time I made it back to the car, my sneakers had gotten somewhat wet, and I had the beginnings of a blister on the left foot. The right foot was tender, but no blister. I had managed to trail run 8.5 miles in the MICROspikes. They are light enough that I didn't feel any extra weight on my feet. They worked well and gave me the traction I needed. I just need to protect my foot from the added pressure of the chains. Next time I take the MICROspikes out for a trail run, I will try running with my Merrell Moab low trail hikers and see if they provide more protection for my foot. The vibram sole and a bit more of a sidewall may be all that I need. I must say I'm a big fan of Micro Spikes. They are easy to put on and remove. I've used them with great success on most hiking trips. They provide great traction for low angle hiking. As you get to more difficult terrain, crampons and ice axes take over, but the spikes can suffice for most terrain. 8.5 miles and 560 vertical feet added to my 2012 challenge! I'm a big fan of microspikes, too. I've never tried to run in 'em, but combined with a pair of snow boots, gaiters, and a couple of snowshoe poles they'll take you into some surprisingly tough winter terrain. Hi Del. Thanks for reading, and thanks for the comment. Yes they really are a good invention. Simple, but they work great. I love my microspikes, but for running on packed snow I really like screwshoes. #4 hexhead screws mounted strategically on the bottoms of your (not so) favorite running shoes. Brant Lake adventurer; fellow Gore slave.